The nomination ceremony for this year's Blawg Review Awards will be held on Thursday, December 27, 2007 at 11:00 a.m. Pacific time at the offices of the Second Life Bar Association. Second Life users can follow this SLURL to the Second Life Bar Association offices on the 6th floor of the "Justice Center." And, for this special occasion, we've retained an experienced Master of Ceremonies. 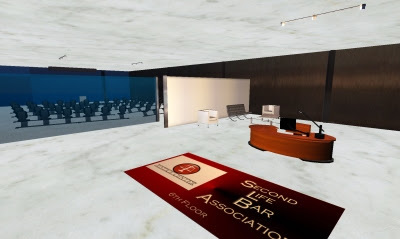 If anyone wonders why the heck real lawyers should pay attention to what's going on in Second Life, may we recommend a recent blog post about Virtual Law by Mike Dillon, Sun's General Counsel. Like the Blawg Review Awards 2005 presented by She-Hulk and the Blawg Review Awards 2006 delivered by Santa Claus, this year's awards will be announced right here, as usual, on the last Monday of the year, New Year's Eve.